"Compliments, this website is very good"
"... makes the book a particularly valuable aid to the healing process"
"I strongly recommend this book if you suffer from repetitive strain injury, it's a great read!" This website and my book have already been featured in several newspapers and magazines. This website describes injuries that occur when performing repetitive movements over a longer period of time, especially while working on the computer (=repetitive strain injuries). For a more precise definition please go to the page "What is RSI?". A RSI almost always manifests itself with pain in the wrist or forearm. But often even more areas of the upper body are affected (fingers, back of the hands, elbows, shoulders and neck area). In addition, even numbness, tingling, swelling, and / or sensory disturbances may occur. You belong to the target group of this website if you regularly perform repetitive tasks (office workers, PC / video game players, assembly line workers, cashiers, musicians, sign-language interpreters ...). Even if you have no symptoms yet, you should at least take a brief look at the summary. RSI is relatively easy to prevent, treatment however is much more difficult and painful. Millions of people around the world experience a form of RSI during their lifetime; avoid belonging to this unenviable group! During the years of my battle with RSI I have been exposed to many limitations and I have also seen a wide range of possible consequences which were experienced by fellow sufferers: I was in pain holding a simple cup and I was unable to open bottles on my own. I experienced pain when eating with knife and fork. I could not work on the computer and not even write something with my hand. If both hands are affected, the quality of life is very restricted and in extreme cases living on your own is no longer possible. If you already suffer from mild discomfort, I strongly advise you to address that issue before it becomes worse. If your RSI is a result of several years of stressful repetitive movements, unfortunately there is no way to fix this from one day to the other. In advanced cases, you should give yourself about half a year to regenerate. Initially you have to reduce the repetitive strain as much as possible. You will need approximately 60-90 minutes daily to perform the exercises described on this website. 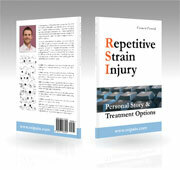 The healing path of RSI is very bumpy: You will have very good days, but also severe relapses. Always try to think positive. There is a way out of this injury! The most important thing is that you never give up and lose hope. All information on this website is based on my personal experience during a three-year battle with the injury, supplemented by advice from other sufferers, websites, doctors and books. Even though I have not had the best experience with some doctors, I urge you to consult appropriate health professionals before trying out any exercises suggested on this website. Even if your symptoms are similar, the cause may be a totally different one! I am not a doctor; I am "only" a former sufferer, who has dealt with this topic intensively. You perform all exercises of this website at your own risk. Print out the relevant pages and discuss the content with a doctor or physical therapist. This website is updated regularly. If you would like to know what has changed since your last visit, please check out my Facebook-Page @rsipain.